Located in Michigan, this home belongs to a couple and their two young boys who were looking for the perfect vacation home. The previous owner was an arborist and left a few design challenges for the new owners. As you will see, this before and after is a good example of how a can of paint can transform a space. 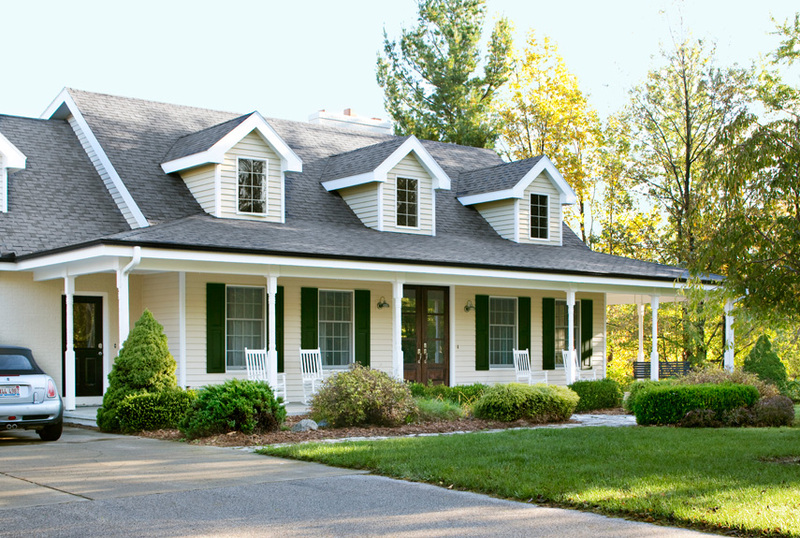 The home's exterior was lightened up using Benjamin Moore's Grant Beige. The living room was very rustic and had wall to wall forest green carpet. The carpet was ripped out and to help unify all the different materials, everything was painted white. Both the fireplace and mantle were painted White Dove by Benjamin Moore. When in doubt, paint it white. The owners had planned to remove the vertical beam that was made to look like a tree growing out of the floor, but it is was determined they couldn't because it was structural. So, they painted it white along with the cabinets. Surprisingly, the kitchen turned out very beautiful. The tree along with the backsplash tile and stone countertops gives it a sophisticated organic quality. The dated master bath got an overhaul. Instead of replacing the awkward French doors, they improved them by replacing the glass with mirror. Job well done. To check out more, visit House Beautiful for the full article.